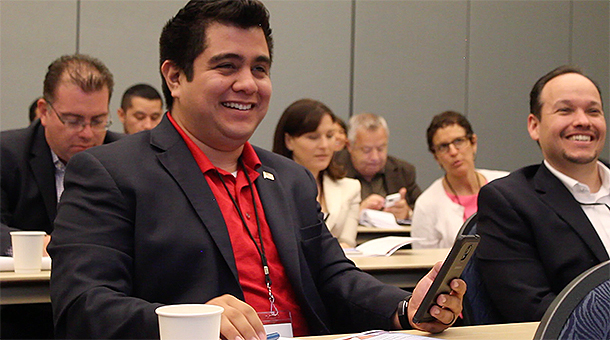 Making sure cities and schools aren't left in the dust of rapidly changing technology was the topic of the Southern California Latino Policy Center forum on Saturday in Los Angeles. "If Latinos are going to succeed in California, technology must be embraced and implemented in our communities," said Luis Ayala, Mayor of Alhambra and Latino Policy Center Board President. "If we are left out, we'll be left behind." An electronic poll of the elected officials in attendance showed they embrace technology and, in fact, use social medial as their primary method to reach the people they represent. And yet, ironically they don't think the cities and schools they represent use technology wisely. But, to get that done, panelists urged the elected officials to make sure cities and schools have a strong plan for adopting new tech, instead of just buying technology for technology's sake. Superintendent Dr. Darryl Adams told the audience about Coachella Valley Unified School District's successful rollout of 18,000 iPads, which has become a model for other districts, as opposed to the more high-profile failure at LAUSD. Channeling the educational term "no child left behind," Adams told the school officials that the mantra should be "Every child online." To not achieve that, he said, is the equivalent of "educational malpractice." City officials were being urged to "have a plan and implement it." And that plan not only should include an initiative investment, but a way to operationalize and manage the technology. She estimated that 20 percent of Los Angeles still does not have broadband in the homes--a number that her organization and others are urgently trying to address. The attendees also discussed a key workforce issue in technology---how more Latinos can be attracted and recruited to the tech jobs pipeline that dominates California's economy. Los Angeles County ranked dead last in the percentage of voter turnout in among California counties in the June and November 2014 elections. The large Latino population of L.A. County, he warned, "will have our voice muted if we don't turn that around."